Tom Ryder started his career at Leicester Tigers before playing provincial rugby for Taranaki. He joined Saracens in 2005 and made a host of appearances for the Vicarage Road side. 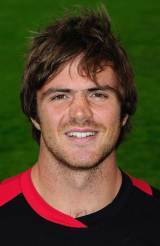 In August 2010 he joined Glasgow on a loan deal but returned to Sarries soon after. But in February 2011 he signed a permament deal with the Warriors - before which he had turned out for the Scotland A side. In January 2012, Ryder was called up to the Scotland squad for the 2012 Six Nations. He failed to win his first cap during the championship but was included in Scotland's summer tour party.